When the major search engines like Google and Yahoo visit your web site, they are looking at the content of the site and for information that will determine where your web site will be ranked in their results. Some of the components of a quality web site the search engines look for include specific keyword phrases that are more dominant than other words on the site. 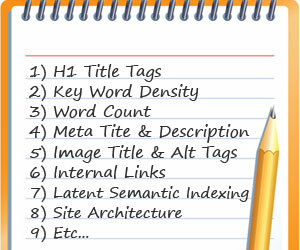 This is how they determine what phrases your sales site or consumer web site should be ranked for in their results. The process by which we at Stark Logic optimize a web site for these targeted keywords is called on site optimization or search engine optimization. The reason why on site search optimization is important is because, when performing a search, Google looks at a website and tries to determine where to position that web site in the search results it displays. If you combine targeted SEO keywords with specific locations on your web site, then Google will also rank the page in its search results for those specific keywords. If you do not add any keywords or locations to your web site, your web site will never show up on the list of results when people type those keywords into the search engine. One of the best ways to earn higher rankings in the results from search engines is to include relevant, unique content on your franchise web site on a consistent basis. If you are able to write and post a new article each week, that would have a strong affect on getting better results from the search engines and further contribute to your on page optimization. However, writing just any generic content is not going to help as much as if you start with a targeted SEO keyword phrase and create a piece of content that has that same targeted phrase in numerous parts of the content, the URL and other tags on the site. The first step in on site optimization is knowing what keyword phrases you should be targeting on your franchise web site or franchise sales web site. The next step is web site optimization. The more places you have SEO keywords in location-specific keywords in your franchise web site, the higher the chance you have of coming up in the search engine results. Utilizing targeted and location-specific keywords throughout your franchise web site as well as including unique content will help add to your over all on site optimization and will likely result in higher rankings in search engine results. 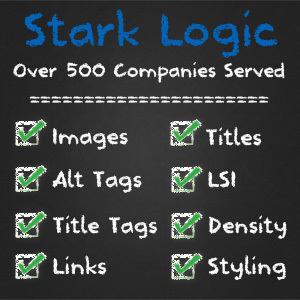 Stark Logic can work with you to create and optimize both content and targeted keywords for your consumer web site, business to business web site, or local web sites.